HELENSBURGH paid its annual tribute to the fallen of two World Wars and other conflicts on Remembrance Sunday 2018, and this was a particularly special occasion as it was the centenary of the World War One armistice. The service took place in front of one of the most elegant war memorials in Scotland within the superb Garden of Remembrance, all refurbished as part of the Hermitage Park improvement project. The 40 feet high white freestone memorial was designed by distinguished local architect Alexander Nisbet Paterson, and it was completed in 1922. It bears the names of 314 who lost their lives in wartime. 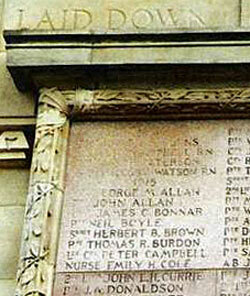 From World War One there are four names from 1914; from 1915 40; 1916 29; 1917 62; 1918 58; 1919 12; and 1920 one. When the memorial was dedicated on June 25 1922, the speakers all referred to the brave men and women who had given their lives in the service of the country. 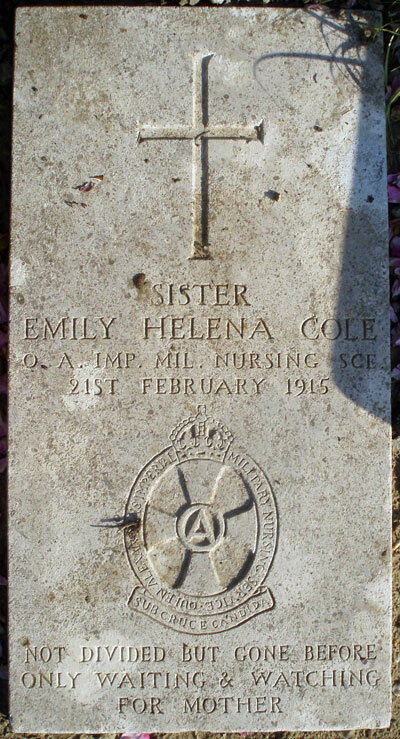 Only one woman is named in the World War One on the Cenotaph, Acting Sister Emily H.Cole, who lost her life in 1915. The Helensburgh connection is that her widowed mother lived in the town at Sunnyside Cottage, 36 West King Street, from 1905-14. Born Emily Helena Cole on June 11 1882 — the family used the name Helena, not Emily — she was the second daughter of Colonial Government contractor C.G.Cole and Mrs E.H.Cole, who lived in Cape Town, South Africa, at the time. After her father’s death, Mrs Cole and her daughters returned home to Bournemouth, and Helena was educated at Knole Hall High School in the seaside town. After leaving school she decided to become a nurse, and she trained at the British East India Company’s Poplar Hospital in the East India Dock area of London from January 1908 to January 1911. She worked there as a Staff Nurse for a further year, before enrolling into the Queen Alexandra Imperial Nursing Service on January 15 1912. She was embarked for France soon after the outbreak of hostilities in August 1914, serving as a Staff Nurse, then Acting Sister, at the 14th General Hospital in Wimereux, Boulogne. 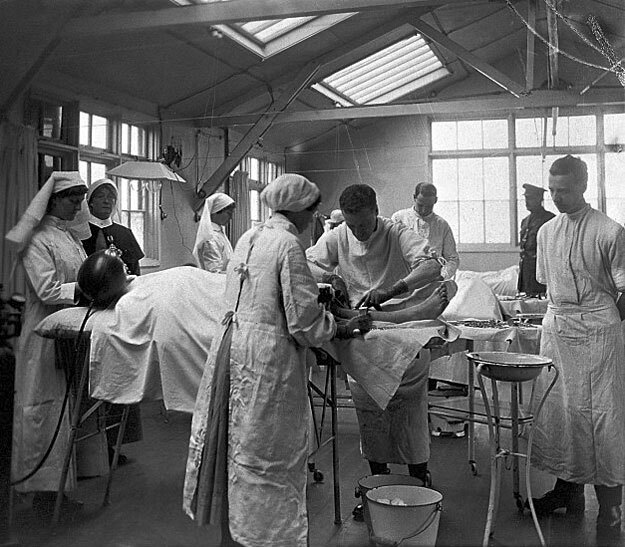 A nurse who worked at the same hospital wrote in her memoirs: “We arrived at Boulogne on October 30 1914. The place gave us the impression of being a seething mass of ambulances, wounded men, doctors and nurses: there seemed to be an unending stream of each of them. “All the hotels were hospitals, which gave one a horrid feeling of disaster. No-one of whom we inquired could direct us to where No.14 Hospital — to which we had to report — was situated. “Eventually we met a matron who was able to direct us. It was a pouring wet night, and we drove up the hill from Boulogne to Wimereux in funny little ‘Victorias’ with a kind of leather apron over our heads. An endless stream of ambulances was slowly making its way in the same direction. “Number 14 hospital was found to be in a large hotel on the seafront at Wimereux. The Officer Commanding was in the hall receiving patients: he directed us to the top floor, where the nurses had their quarters. “Every place was packed with sick and wounded lying on the floor; you stepped between them, and over them, to get along. As soon as we could get into our indoor uniform we went straight into the wards. “I relieved the matron in the theatre, where she was busily working. Operations went on unceasingly. As fast as one patient could be taken off the operating table, another was placed on – and so on all through the night: the surgeons had been at it the whole day. “As I went to bed in the morning I met the orderlies carrying patients down the stairs for evacuation by boat to England, while the doctors were helping to carry in another convoy which had just arrived. After six months there, on Thursday February 18, Helena took ill. According to the South Africa War Graves Project, she initially suffered from a headache. The project website states: “On Friday morning she fell unconscious on to the floor whilst dressing, and was found by Miss Clements, the matron. “Sir Bertrand Dawson was sent for and she was given some vaccine treatment from which she seemed to be positively responding. Helena died of cerebral spinal fever, a form of meningitis, on Sunday February 21, aged 32 years. Her mother, who had returned to live in Bournemouth, placed a death notice in the Helensburgh and Gareloch Times edition of February 24. The paper itself reported: “Intimation has been received of the death on Sunday at Boulogne of Nurse Helena Cole, who was with the British Expeditionary Force. She was buried at Wimereux War Grave Cemetery in Wimereux, a coastal town situated some three mile north of Boulogne in the Pas-de-Calais department in the Hauts-de-France region, near to some military hospitals. Several members of the Queen Alexandra’s Imperial Military Nursing Services and Royal Army Medical Corps are buried there. The Commonwealth War Graves are located in a separate area from the civilian graves. Unlike other war grave memorials, the headstones lie flat against the ground because of the soil in the graveyard is sandy and does not support the weight of an upright headstone. There are 2,845 war graves from the First World War and 14 war graves from the Second World War in what is now called the Wimereux Communal Cemetery. As well as the Helensburgh Cenotaph her name was inscribed on a marble tablet in the chapel of Queen Alexandra’s Military Hospital, Millbank, London, which listed the names of the matrons, sisters and nurses of the military nursing services who died during World War One. After the Millbank site was redeveloped, the memorial was moved to the Royal Garrison Church, Farnborough Road, Aldershot, Hampshire. Helena was awarded the 1914 Star, and posthumously the British War and Victory Medals. They were sold at auction in London on November 25 2015, together with her bronze Q.A.I.M.N.S. badge, and were expected to fetch around £300.